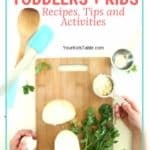 I am very excited that Your Kid’s Table is hosting its very first giveaway! Last month I reviewed a fantastic little gadget, FunBites, see that post here. 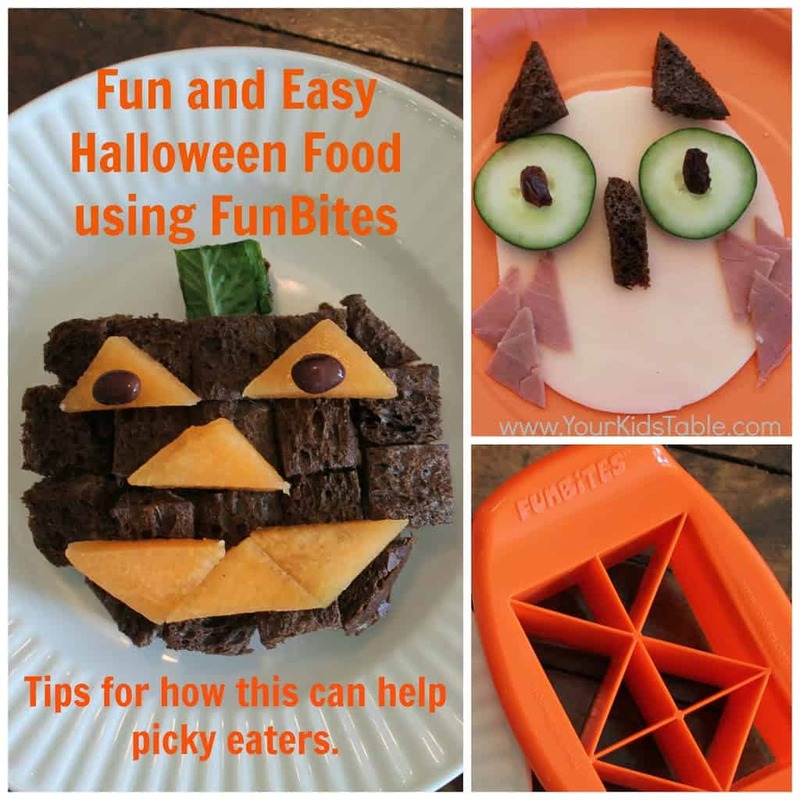 FunBites gave me another shape to try out, triangles, for some inspiring Halloween foods, as always full disclosure. In addition to a great coupon that can be used directly on their site for 20% your entire order, they are also going to give one of you a free triangle FunBites to make all of your own fun Halloween foods! The coupon and details for entering are at the end of this post. 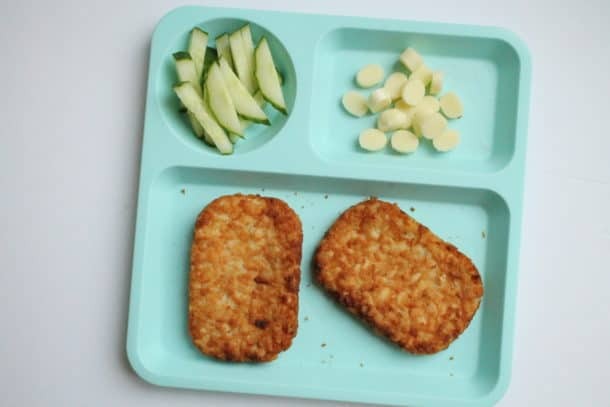 As an occupational therapist, I really love FunBites– as I mentioned in my review, I actually sought them out. 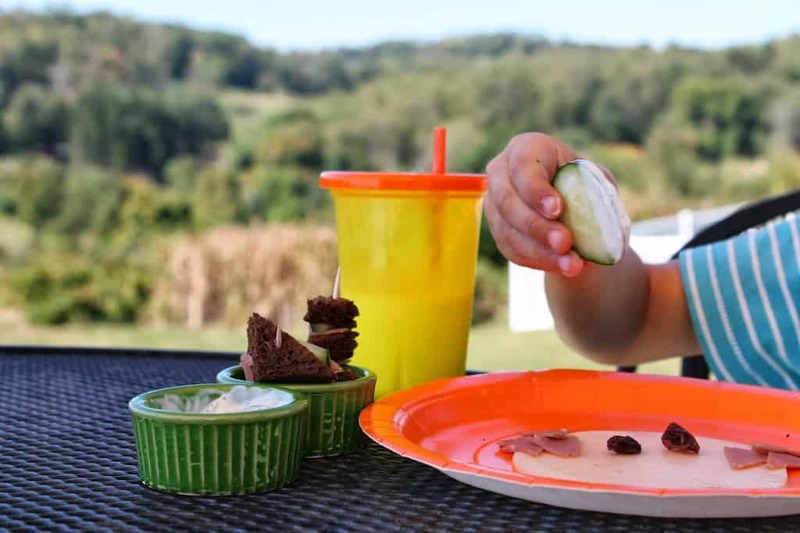 I’m so impressed with this mom that designed this tool for her “picky” eater. I saw an add on another website and immediately thought, “Oh, what is that? 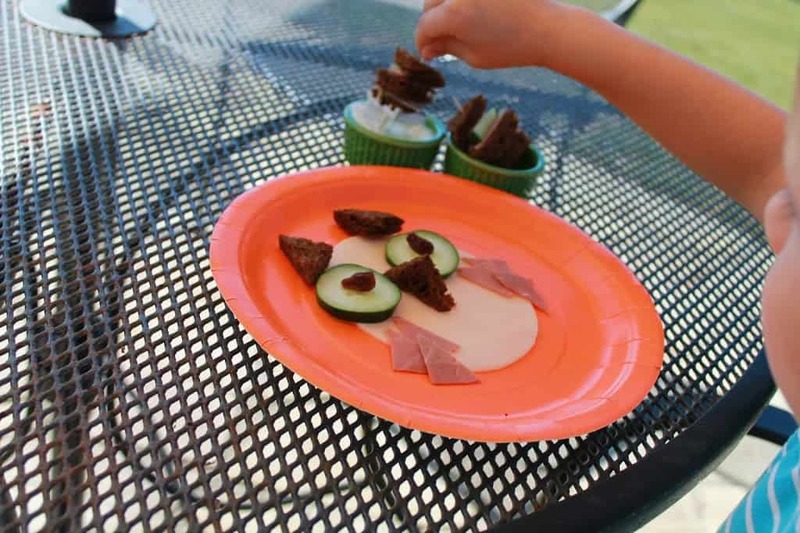 It will be perfect for the kids I work with!” To briefly re-cap, kids with difficulty chewing or textures can handle small regularly shaped pieces of food better than large irregular pieces. It not only gives them a sense of comfort, but is physically easier for them to eat. Plus, it is fun! It was great to have both the triangle and square to work with, it definitely allowed for some more creativity. The triangle worked just as well as the square, but had different sized triangles. I did cut up some actual sandwiches this time and I had to really rock and push to get it to cut through all of the layers, especially the roast beef and ham. I quickly had to use a knife to completely separate a few meaty strands that were still stuck, which wasn’t a big deal. 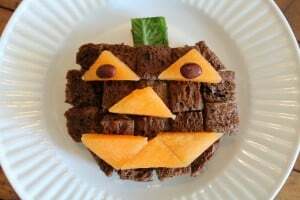 I have to admit coming up with some Halloween themed foods was quite challenging for me. I usually don’t get in to making elaborate themes and as you can see, mine are fairly simple. I honestly can’t believe some of the foods I see people pinning, the time and amount of ingredients is overwhelming to me. But, if it is fun for you and your little one appreciates it, then that’s great. Once I figured out what I was going to do, it was really easy and my older son loved it, like I said, I kept it simple. I was careful to use only a few ingredients and you’ll see that I repeated them in both Halloween scenes. Obviously, I didn’t want to waste the food, but it was beneficial for my kids to have repeated exposure to non preferred foods. 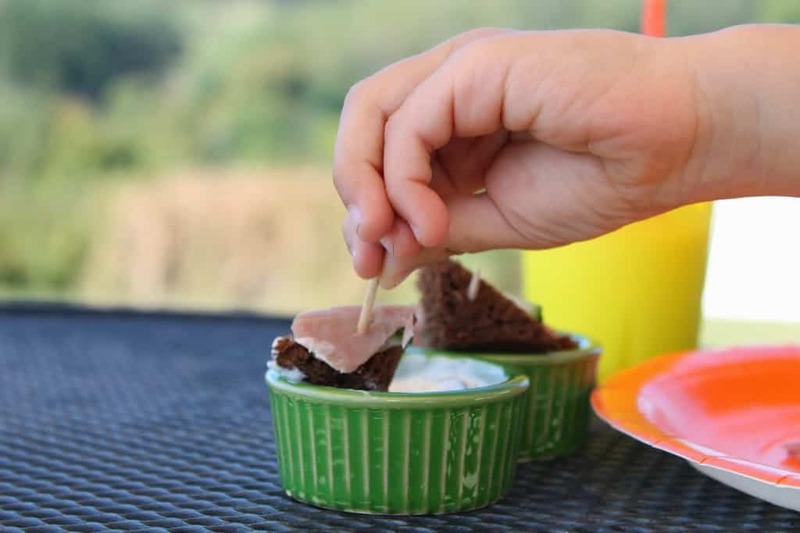 It was most important to me to incorporate some foods my kids refuse or rarely eat. I wanted to see how FunBites could help them with their variety. 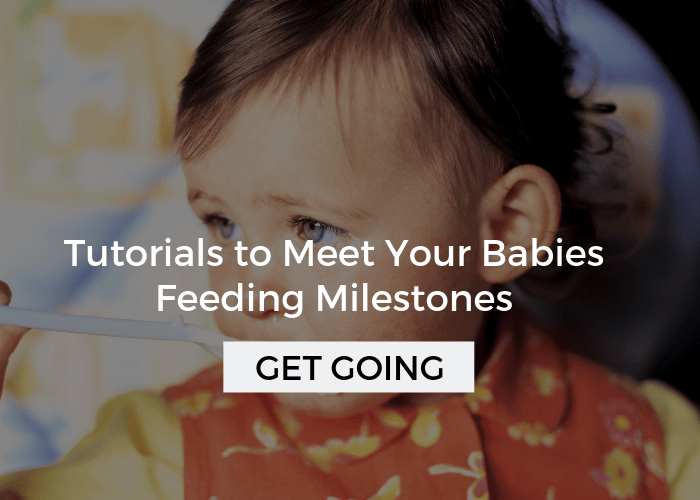 At the same time, as I talk about in, Basic Strategies to Improve Eating, I had to make sure that there was some familiarity. It is really important to strike that balance or you could lose them all together. My kids are so young, 3 and 2, that they don’t really know a lot about spooky Halloween. I made an owl and a jack-o-lantern. My kids rarely eat cucumbers, have never tried pumpernickel bread, refuse roast beef, love tzatziki sauce, usually eat raisins, and rarely have provolone cheese. Can you see the balance of challenge and comfort I’m trying to strike here? 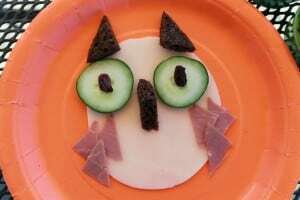 I served small tzatziki sauce and toothpick sandwiches with the same ingredients from the owl on the side. I was surprised that my son immediately gravitated towards the sandwiches. Then, he immediately went for the cucumber, eating both entirely! The pumpkin didn’t go as well. I made this while my son was taking a nap. He was getting over a virus and slept incredible long, when he woke, guests were in the house. I think he was a little overwhelmed and disoriented, as he ate only the cantaloupe and black beans. A whole melt down ensued because lettuce was on his plate, I wasn’t expecting that extreme, but after a few minutes we were able to sit calmly and politely refuse the sandwich. I would have liked to work with him a little, but because of our company the dynamics shifted. We will try again. If you need help working past food refusals, click here and here. Place cheese down first and leave whole. 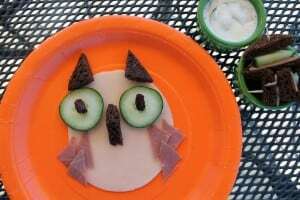 Then place cucumber slices on top to make eyes, with raisins inside of eyes. Use FunBites to make 3 triangle shapes from the bread. The nose is standing up on end. Then use to make 6 triangles for roast beef, you will have to cut it in two different spots to have enough of the correct sized triangle. 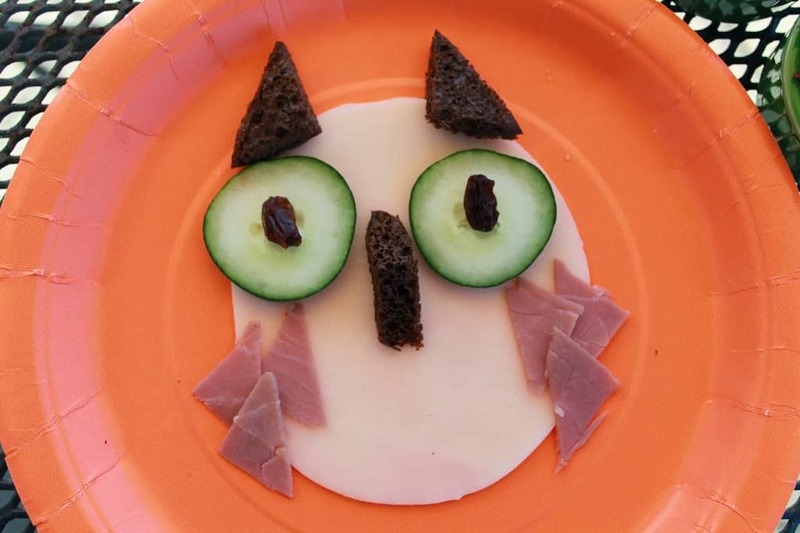 Place at least 3 triangles of roast beef on each side of the owl to make his feathers. 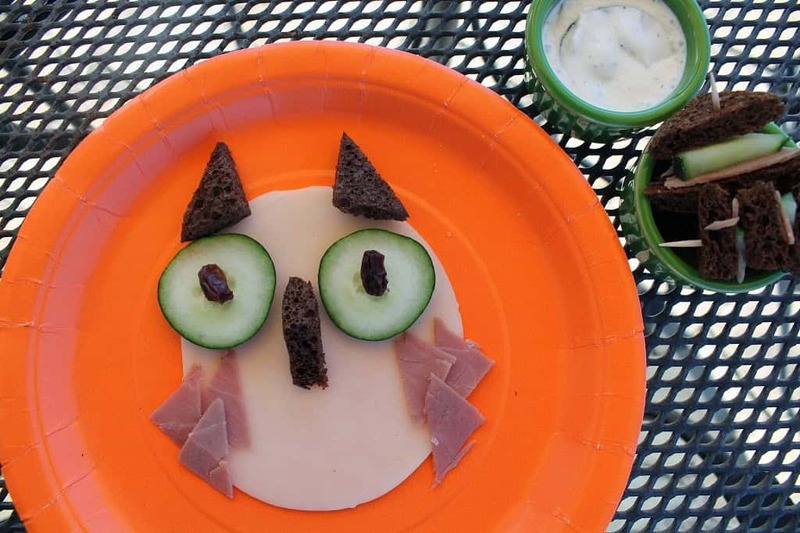 I used all the leftover triangles to assemble little sandwiches on toothpicks and served with tzatziki on the side. Assembly the sandwich with ham and tzatziki sauce spread on one side. 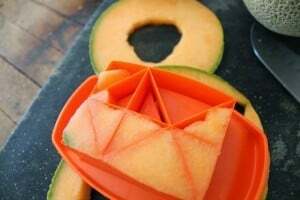 Use square FunBites cutter and make into as round a shape as possible. With the leftover pieces of bread use the triangle cutter, making sure you are placing the smallest triangles over the bread. Take the small triangles and fill in around the pumpkin to make it look more like a circle. 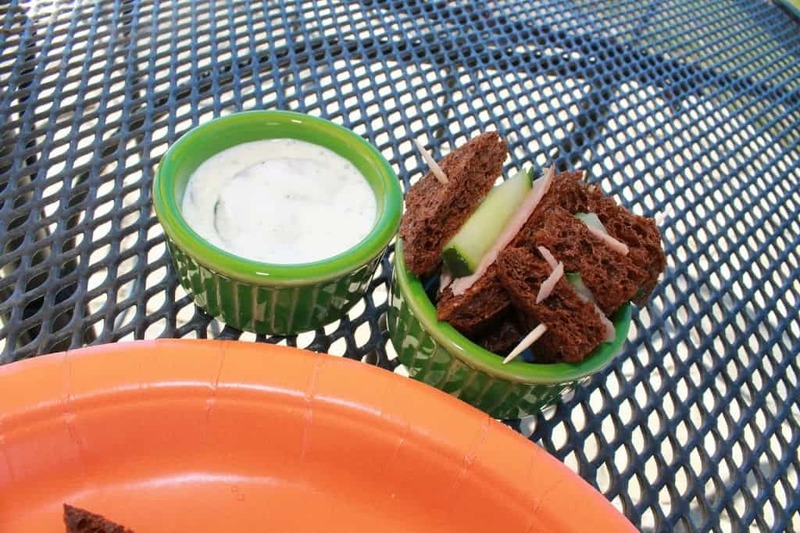 Take a small scrap of bread and place it at the top to hold the lettuce. Then take the square FunBites and cut the lettuce. I stacked a couple squares together. 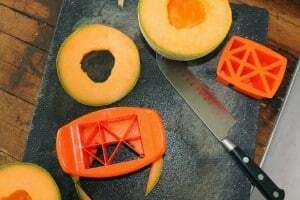 Lastly, take the cantaloupe and cut out six of the same sized cantaloupe. Assemble the face. Click here if you would like to buy your own FunBites, they have heart shapes in addition to squares and triangles. The coupon code for 20% your order is yourkidstable. 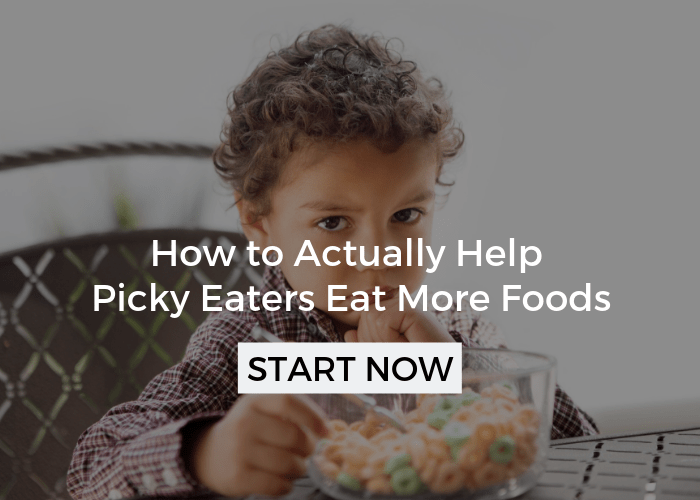 Come get more fun food ideas for picky eaters on Pinterest with me! 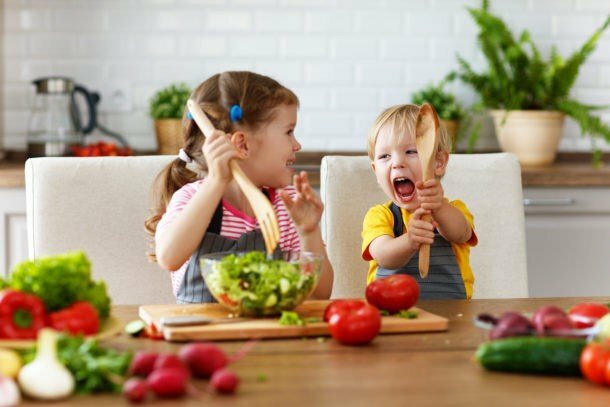 Your Kid’s Table is an affiliate of FunBites and received a complimentary triangle FunBites for this post. By entering the contest you agree to have your name announced on this site and social media sites. This is amazing, why didn’t we think of that! Oh my gosh- I’m loving all these comments! You all have such great thoughts! For those of you that are really struggling, I do offer consultation services at a very affordable rate- although if the prices are a problem, let me know and we can discuss that. Love your blog. As a foster parent of a dev. delayed child, I have all sorts of learning to do, but keeping her full is often difficult. Thanks for the great ideas. 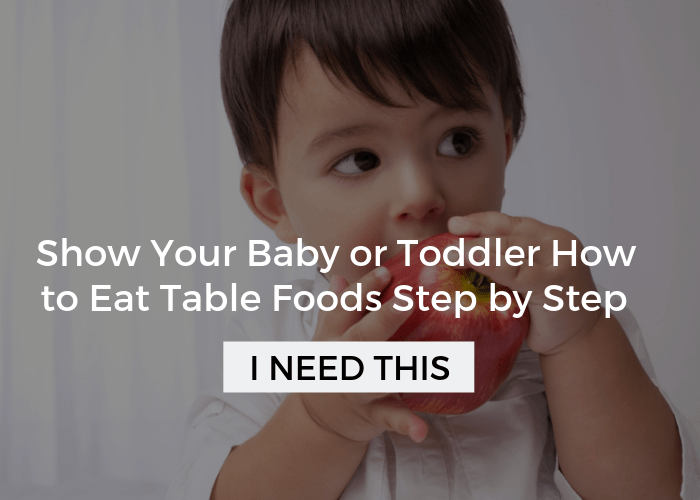 This is a great idea as I’m trying to introduce more foods to my 2 year old, or rather get him to like more foods. 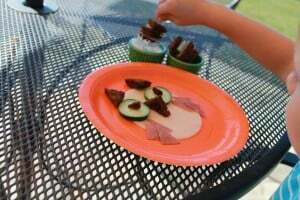 I have been using cookie cutters to entice my son to eat his sandwiches at school. I think I need to explore more with FunBites to get more of a variety of shapes! My son is beyond picky. I think it is a texture thing. I have noticed that he tends to go more with crunchy foods though. My two year old son is a very picky eater and has texture problems. He gags a lot if he does happen to try something new. 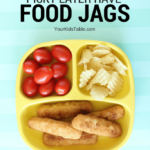 I would love to see if this would help since you mentioned that kids with texture problems can handle small regularly shaped pieces of food better than large irregular pieces. It would be wonderful for my 2 1/2 year old. She has been failure to thrive since 6 months, and was literally eating nothing for days. 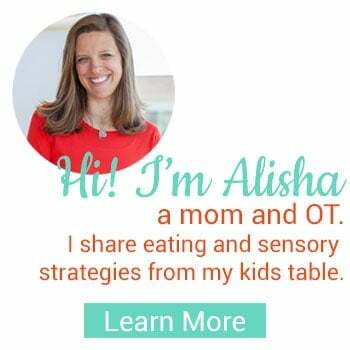 Now that she has been to OT, her eating has been improving, and we are always looking for new and fun ways to encourage eating! I’d love to try this with my son! He rejects most foods just by looking at them. Maybe this would help foods look more fun! Love your blog, I found it while looking for OT blogs. 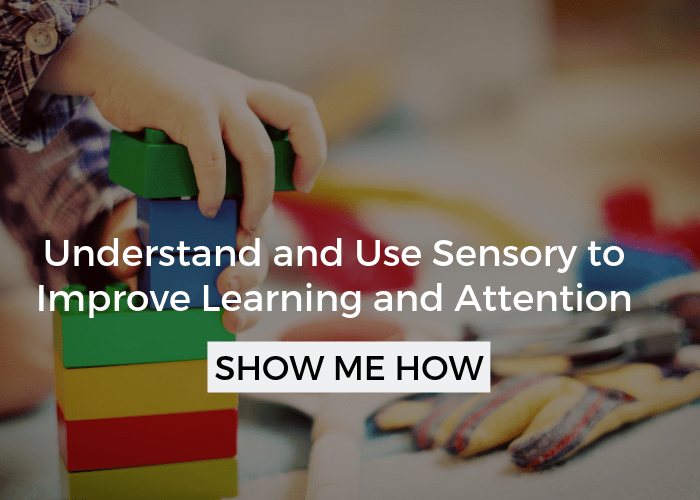 My oldest sees an OT for sensory and motor skills. My youngest (almost two year old) is my picky eater. I have been able to use a couple of your tips with success. Thanks! I might have to try something like this for my little man! it would be a miracle if he ate more than 3 things. I’d like to make snack time more interesting! I love your great halloween ideas! I would like the triangles in particular because you can do so many things with them!